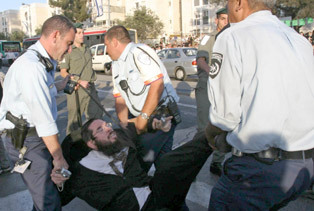 Police officers arrest demonstrators in Jerusalem after protestors against Israel’s Gaza withdrawal disrupt rush-hour traffic across the country on May 16. JERUSALEM, May 16 (JTA) — Political tensions in Israel, simmering over the plan to withdraw this summer from the Gaza Strip, appear close to boiling over. In their most sweeping and coordinated protest yet, hundreds of right-wing activists flooded key road junctions across Israeli Monday, burning tires and paralyzing traffic despite a heavy police deployment. Some 40 people were arrested. A separate case that came to light suggested there might be deadlier violence in the works: The Shin Bet announced it had arrested five Israelis suspected of planning to attack the main Muslim shrine on the Temple Mount. “We are on alert for any and all worst-case scenarios,” Internal Security Minister Gideon Ezra said. Having overcome all the parliamentary hurdles and ministerial infighting, and having received the blessing of President Bush, Prime Minister Ariel Sharon seems intent on carrying out the “disengagement” from the Palestinians by withdrawing from Gaza and the northern West Bank in August. But Sharon’s certainty might prompt opponents of the plan to opt for extreme measures, officials fear. Right-wing leaders dismiss such statements as politically loaded alarmism, but admit that no one can predict what deranged loners might attempt. Topping the list of potential targets is the Al-Aksa Mosque on the Temple Mount. The five Israelis arrested last month are suspected of planning to fire an anti-tank rocket at the shrine, then fend off security forces with grenades before committing suicide. They denied any wrongdoing. “I am against any action that would cause innocent casualties,” Eyal Karamani, one of the suspects, told reporters at a Jerusalem courthouse. Karamani and the four others were released from custody pending a decision on whether to press charges. Israeli media quoted Justice Ministry officials as saying there may not be enough evidence for an indictment. The suspects accused the Shin Bet of arresting them on the strength of an agent provocateur, known as “Baruch,” whom they alleged had urged them to mount an attack on the Temple Mount. While such an action would draw the wrath of millions of Muslims against the Jewish state, the tactic of blocking traffic appeared aimed more at fomenting internal strife. In the Tel Aviv suburb of Givat Shmuel, stalled motorists and sit-down protestors almost came to blows in the absence of an adequate police response. “You’re not Jews, you’re scum!” one middle-aged man screamed at the young men sprawled in front of his car. The events highlighted the limitations of Israel’s security forces in handling nationwide demonstrations. Many of the junctions were blocked despite the fact that police had deployed in advance, tipped off by leaflets distributed by a far-right political group called “The National Home” that called for mass demonstrations. Police sources said undercover patrolmen had been posted at the flashpoint sites, some with video cameras to help track down protest ringleaders. But such follow-up probes may not be necessary: Israeli media quoted unnamed senior members of the Yesha settler council as saying the demonstrations had hurt the anti-disengagement cause by alienating many citizens. In another sign that withdrawal is inevitable, Channel Two television said “several hundred” families from the main Gaza settlement bloc of Gush Katif had agreed to be relocated to Israel voluntarily, parting company with residents who have vowed to stay put. Settler spokesmen were not immediately available for comment.